12 things to consider when choosing your assessment-based recruiting tool. 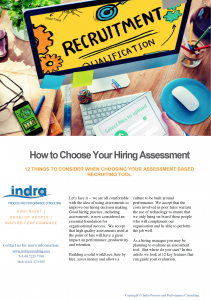 If you are planning to integrate assessments into your hiring process, this 11 page guide is written for you. By downloading you will automatically receive periodic updates when new resources are published. Of course you can unsubscribe at any time. But I hope that you will see the value in staying.